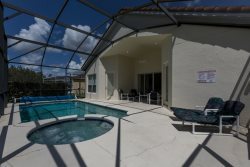 Our Floridian Villa home is located just 10 minutes from Highway 192 in the Kissimmee area, on the fantastic resort of Trafalgar Village surrounded by beautiful woodland. Set on a quiet cul de sac in a private setting, surrounded by nature,our home oozes charm and luxury. 6 bedrooms/5 bathrooms, 3 of which are en-suite. A fully equipped kitchen and spacious Dining room. Lounge with TV entertainment unit, with 40" tv and dvd/cd player, Dvds and Cds are supplied for your use. A playstation PS2 for the kids. An informal lounge for relaxation. A utility room, with washing machine and tumble dryer. A private pool and spa area, with pool bathroom. A large extended pool deck, bathed in sunshine and not overlooked. A long front porch with beautiful wicker furniture, giving you a feeling of transporting back to the colonial era. We also feature a Key West themed Margaritaville style games room, with airhockey/pool table and dartboard. Our home is furnished to a very high standard throughout , with baby cot and highchair. There is air conditioning, giving total comfort for you, your family and friends. The resort is a gated community with 24 hour security. It features a Clubhouse, with pool/jacuzzi, fully equipped modern gym, games and arcade room, childrens play area, 48 seat private cinema and internet room. There is a beach with volleyball and a lagoon. 2 fishing lakes and nature trails, walking and cycling is a pastime to be enjoyed. The resort has a clubhouse, with a 48 seated cinema, a fully equipped gym, billiards room and arcade games room. A fabulous family pool and kiddies splash pool local amenities10 minutes drive in either direction, you will arrive at an amazing array of shops and restaurants, to suit every taste. Supermarkets ie, Walmart, Publix, Winn Dixies are numerous and located in many areas, these will cater for all your shopping needs.